Another feature just went live… we’re on a roll! 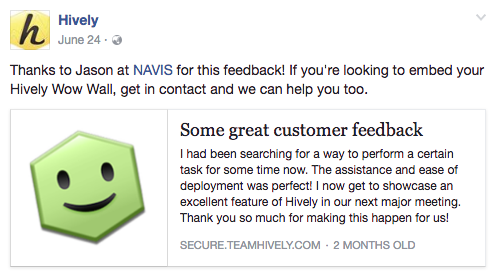 With this latest release, you have the ability to share feedback to Twitter and Facebook from within Hively where permission has been given by the rater. This feature will be particularly handy when you receive ‘testimonial style’ feedback. For a long time, we’ve had a checkbox on the rating page asking raters whether their feedback could be shared for Wows. More recently, we added the same question for Happy ratings as well.